It doesn't set out to do so, but an exhaustive profile of an Islamic cleric in Sunday's New York Times magazine makes the depth and severity of radicalization among some young Muslim Americans very clear. Reporter Andrea Elliott devotes nearly 8,500 words to Yasir Qadhi, in the article "Why Yasir Qadhi Wants to Talk About Jihad." It casts a picture of a very conservative but generally peaceful Salafi Muslim. As such, he is cast as the ultra-conservative Muslim antidote to al-Qaida cleric Anwar al-Awlaki, who is credited with inspiring everyone from Fort Hood shooter Nidal Hasan and would-be terrorists Umar Farouk Abdulmutallab and Faisal Shahzad. But Qadhi, dean of academic affairs at the Houston-based AlMaghrib Institute, rarely is shown aggressively challenging the radical ideas the fuel violent jihad. If anything, he agrees with them, including a notion that the U.S. is at war with Muslims. That message is considered among the most forceful in radicalizing young Muslims into supporting violence. Like his students, religion is more than a personal belief system to Qadhi. He would like to see "the world … fully adhere to his faith," the story says. He won't say whether he considers attacks on U.S. troops in Iraq and Afghanistan to be legitimate jihads. It is due to a delicate balancing act, the story explains. If he speaks too openly about "what kinds of militant actions are permitted by Islamic law," he risks being labeled unpatriotic and possibly even prosecuted, Elliott writes. When he tells his students to use the power of their votes and their voices, they push back, wondering if that's enough to meet their religious duties. A female student criticized Qadhi for providing "wishy-washy nonanswers." And she was not persuaded that there are more peaceful ways to pursue jihad. Elliott described it this way: "Being martyred in the battlefield, she said, is 'romantic,' while 'lobbying your congressman is not.'" He is shown arguing why the failed Christmas Day 2009 bombing of a commercial airliner was wrong under Islam. "There were even Muslims on that plane!" he said. "I mean, what world are you living in? How angry and overzealous are you that you simply forget about everything and you think that this is the way forward?" But he acknowledges being hesitant to take on some of his students' positions forcefully out of fear he'll be dismissed from their consideration. His students are well educated and seemingly comfortable economically. But they struggle with the proper Islamic response when America is waging war in Muslim lands. America is a newly hostile country for Muslims, the story says. "They have watched as their own country wages war in Muslim lands, bearing witness — via satellite television and the Internet — to the carnage in Iraq, the drone attacks in Pakistan and the treatment of detainees at Guantánamo," Elliott writes. "While the dozens of AlMaghrib students I interviewed condemned the tactics of militant groups, many share their basic grievances." 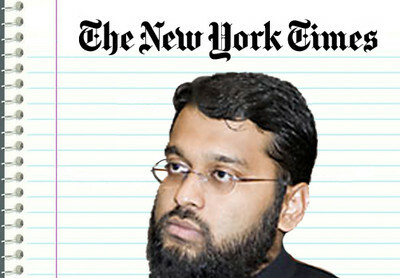 The Times profile notes Qadhi already is derided as a "sellout" on some jihadist web sites. The result, however, may be that he fails on both sides. In an example not mentioned in the article, Qadhi was unable to state a clear position on the January assassination of a Pakistani governor who was openly critical of that state's blasphemy laws. In an online posting, Qadhi republished an article by a Pakistani writer. Salman Taseer's murder by a bodyguard was an issue with "many facets and perspectives to consider, and it is simply not possible for an outsider (as we all are here in the West, even if some of us originate from Pakistan) to fully understand the nuances of the situation," Qadhi wrote. The Pakistani writer offered a "very balanced" assessment, Qadhi wrote, acknowledging "(t)here are clear elements of truth on both sides and clear elements of exaggeration and extremism on both sides as well." According to the writer Qadhi cited, the issue should be discussed dispassionately. "Representation from different schools of Islamic thought should be gathered," he wrote, "and, together with legal experts, a solution should be sought whereby, at least, the misuse of this law for personal gain or revenge should be curtailed." Neither writer came out and called the assassination wrong and unacceptable in a modern, civil society. Vague messages from Qadhi are numerous. In the profile, he advises an audience to heed the law of the land. But, Elliott writes, "their 'responsibilities would be different'" if they lived in Palestine or Iraq. "He did not elaborate." It is not the only time he has advised people to obey the laws of man even if that means tolerating something they might otherwise act against. In a video posted to YouTube in March 2008, Qadhi responds to a British television program which sent undercover cameras into mosques, finding that "a message of hatred and segregation is being spread throughout the UK" by groups considered moderate and mainstream. That included messages "condemning British democracy as un-Islamic and praising the Taliban for killing British soldiers." Qadhi accused the producers of editing statements to make them look worse than they were. One part apparently dealt with intolerance toward homosexuals. Islam considers that a sin, Qadhi says in the YouTube clip. "It is a crime against Allah… Are we going to do something against homosexuals? No, we are not. This is not our country. This is not our land," he says. "But we're allowed to speak against it, are we not? Our country has promised us the right to freedom of speech." Elliott does address blatantly radical statements Qadhi has made in the past. That, he tells her, was "the old me." While he maintains an ultraconservative religious viewpoint, he said he moved away from the violent jihadist perspective. He traveled to Auschwitz and Dachau last summer, telling Elliott the experience compounded his shame over past remarks about the Holocaust. Elliott makes a point of showing ways in which Qadhi is like most other Americans. He lives in Memphis, "a long way from the centers of Islamic thought ," calls people "dudes," drives a Honda and enjoys Popeye's "popcorn shrimp and gravy-slathered biscuits." But he still sees the United States as hostile toward Muslims, Elliott writes, saying those like him, "who engage in controversial rhetoric are treading on thin ice" legally. That was Qadhi's reaction to the conviction of a former mentor, Ali al-Timimi, on terrorist-related charges. Days after 9/11, Timimi urged a group of followers to travel to Pakistan for military training from the terrorist group Lashkar-e-Tayyiba so that they might fight U.S. troops as they invaded Afghanistan. Elliott minimizes the facts in the case, ignoring the Lashkar training and saying the men merely "practiced shooting at a paintball facility." Presiding federal Judge Leonie Brinkema emphasized that connection when she sentenced Timimi to life in prison. "I don't think any well-read person can doubt the truth that terrorist camps are an essential part of the new terrorism that is perpetrated in the world today," she said. "People of good will need to do whatever they can to stop that." As Elliott's own newspaper reported, Brinkema rejected the argument that Timimi was punished for his words alone. "This was not a case about speech; this was a case about intent," Brinkema said, finding Timimi meant to incite others to violence against the United States. After the conviction, Qadhi called Timimi "one of the more sophisticated voices of reason representing orthodox Islam in the Western world" and decried his trial as a "witch hunt." That Qadhi seems to continue believing Timimi did no wrong in inspiring people to commit violence leaves open whether he is an authentic voice in opposing violent jihad. Also left unanswered is whether his approach to radical Islam is effective. Abdulmutallab attended AlMaghrib's summer institute 18 months before trying to blow up a Detroit-bound airplane with explosives sewn into his underpants. He had access to the teachings of both Qadhi and Awlaki and chose Awlaki's side. For over a century the N Y Times specialized in misinforming its readers about major topics of interes, ranging from the rise of Socialism and its meaning to the rise of Facism, Hitler and the "slow disappaearance" of the jewish community in Europe during the war. They purposely misled the public on the atrocities of Stalin, Mao and most admiringly portrayed Benito Mussolini, the original "Socialist", most loved by FDR. When Fidel landed in Cuba, the NY Times wrote most lovingly about this "charismatic" new age "leader", and whenthe Fidel trained and supported terrorists in El Salvador were murdering thousands of their own citizens, no resources were spared, including the removal of lefty Ray Bonner, a certified lawyer, who actually reported the truth for a change about a gruesome National Army (trained by U.S) massacres in the Morazan Mountains, bending over to pressure from undersecretary Sanders, during the Reagan era. This is a daily that was one of the first to know about AIDS, hiding the news in the back pages of the Sports section in 1981...this list goes on and on...the spineless and utterly unethical and devious Leftist editors, have taken the jewel in the crown and turned it into a Rhinestone.